What a great time Angela and I had today making watermelon cupcakes for Facebook live! Did you get to see it? If not, check it out here. These cupcakes are easy to make and, of course, delicious to eat, plus they make everyone ooh and ahh. You’ll definitely want to make them, so here’s the recipe for you! 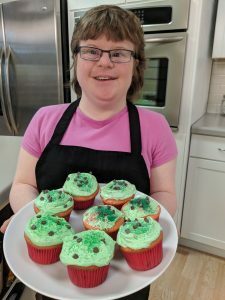 If you do make them and are an LCE member, post a picture of your cupcake creation here — we would love to see them and share them on social media with our friends! 1) Preheat the oven to 350°F. Put a cupcake liner in each hole in the muffin pan. Set the pan aside. Pour the cake mix into one of the big bowls, then add the water, vegetable oil, vanilla, and eggs. Use the whisk to stir everything together until there are almost no lumps. Squeeze about 20 drops of red food coloring and about 10 drops of yellow food coloring into the cake batter. Stir it in with the whisk until there are no streaks and the batter is watermelon-colored. Now stir in the chocolate chips. 3) When the cupcakes are done, take them out of the oven with the hot pads and set the pan on a towel or cooling rack on the counter. After 10 minutes, carefully take the cupcakes out of the pan and place them on the counter; put 6 more liners in the pan and fill with the rest of the cupcake batter. Bake these cupcakes just like the first and cool completely (the cupcakes must be totally cool before frosting them. If they’re warm the frosting will melt off the cupcakes.) While the cupcakes cool, use the rubber scraper to scoop the frosting into the other big bowl. Add 20 drops of green food coloring and 10 drops of yellow food coloring, then stir it in with the rubber spatula until the frosting is green and no streaks remain. Frost the cooled cupcakes with the green frosting and sprinkle with more chocolate chips if you’d like.